I am not a “mathy” mom. I never enjoyed math in school. I would do anything to get out of doing math. I just don’t “get” it. Well, after teaching with Right Start Math for 3 years, I enjoy math and I understand the hows and whys behind what we’re doing. In fact, math is now one of my favorite subjects to teach! We tried a few programs before we landed on Right Start Math with Curly. I started her back in Level A and she needed that review. We did well for about half of Level B before getting stuck and spending months reviewing and practicing. Then we started in on Level C and blasted straight through in one semester. The girl’s math skills are amazing! I’m so proud of how hard she’s worked on math and how well she’s now doing! We start Level D very soon…. Tiger started in Level A in preschool and moved through at a steady pace. He’s now plowing straight through Level B and nothing has stopped him yet. He will probably be starting Level C next year. Bee just started Level A and is slowly working through lessons with me. She’s grasping the concepts well and I know that she’ll be promoting to Level B sometime next year. Right Start is a different kind of math program. It’s not like any that were used when I learned math in school. This program has a ton of manipulatives. There are math manipulatives used in the program that I never knew existed. Truly there is a manipulative for everything. (Yes, they are a pain to store which is why I have all of them in various baggies tossed into a canvas tub that sits on my bookshelf). Right Start is hands-on every single lesson. It uses various games to teach concepts and to provide practice and reinforcement. There are not packs of flash cards or even pages of repetitive worksheets. Concepts and drilled through the use of various math games – imagine playing “Go Fish” to practice the numbers that add up to 10 or play the game “War” to practice subtraction facts. It is fun! The lower levels require very little writing. This is so perfect for starting with younger ones who don’t write well yet or don’t have the attention span to sit and complete worksheets. The math is hands-on and interactive. It requires the teacher to be present and guide the student through every step but it works well for younger ones who can grasp the concepts but need the teacher direction. 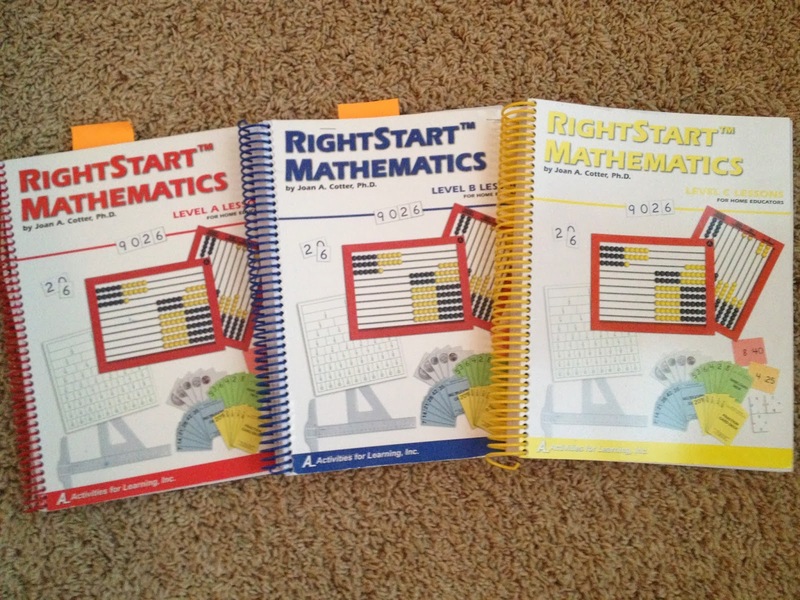 Right Start uses the discovery method for teaching math. Concepts are not introduced and taught to the student. Instead, the student discovers concepts through uses the manipulatives and arriving at a conclusion. Then the child has learned the concept and has a deeper understanding of the whys behind that concept. They don’t just tell you that 2 plus 2 equals 4. No, you actually see how 2 plus 2 must be 4 through using the manipulatives and arriving at the conclusion. The program is not a mastery program but instead contains some review so that topics are introduced and then built upon. Each lesson begins with warm up exercises that review previous concepts. In this lesson the child says all the even numbers up to 3-ten (30) and then the odd numbers to 2-ten 9 (29). The child also says all the ways to partition 6 and 7 (all the various ways to equal 6 and then all the ways to equal 7). At the beginning of the lesson you do more review. First you show a penny and ask the child to name it and its worth. You also ask the child about various shapes such as quadrilaterals, parallelograms, triangles, rectangles, and squares. The child has to classify a square and state if it is any of the shapes listed. Then the child demonstrates parallel and perpendicular lines. Lastly, you show the child a nickel and ask them to name the coin and state its worth. For the lesson, you introduce a dime and its value. You ask the child how many pennies and how many nickels equal one dime as well as how many dimes make a dollar. Then you find all the ways to equal 20 cents using pennies, nickels, and dimes. The last portion of the lesson contains addition word problems in which the child must either add to find the sum or find the missing addend when one addend and the sum are given. For the warm up, the child counts by 4’s to 40, by 3’s to 30, and by 6’s to 60. Then you write out all the numbers counting by 3’s to 30 in 4 rows. The child is to look for patterns. Next, you give the child various multiplication problems (all multiples of 3) and the child solves them. The child also counts by 7’s using the abacus. The lesson introduces the fraction 1/6. The child lays out the fraction strip manipulatives of 1 whole, 1/3’s, and 1/6’s. Then you ask questions such as “How many thirds do you need to make a whole?” and “How many sixths do you need to make a half?”. Using the fraction strips, the child compares the various fractions. The last portion of the lesson contains a worksheet in which the child divides triangles and circles into various parts and colors a portion of each one as indicated by the fraction given. There is a ton of stuff to buy and store for each level (I use the old version – with the new version you buy manipulatives up front with the first level). Price can be a deterrent. But I have multiple children who use the program so I only have to buy the workbooks for them. I invested in the manipulatives because I knew I would be able to use them with all of my children. And I keep everything stored together in one big canvas tub so I can quickly find all my supplies. It is teacher intensive. It is not a fill-in-the-blank or complete the worksheet type program. I don’t hand over a text to my child and have them read it, learn it, and fill it all in. Nope, I am there to introduce each topic and direct every lesson. So, when you have multiple children that you are teaching it can be a challenge to balance my time. Here’s how I make it work: I teach Level A for only 15-20 max, Level B for 20-25 min max, and Level C for 30 min max. I literally watch the clock and find a stopping point when our time is up. If we don’t complete a lesson we pick up the next day where we left off. Some days I reserve only for playing the games and don’t try to complete a lesson that day. In Levels B and C I have my children do many of the worksheets on their own and not during the lesson time. It can seem random. I’ve heard this complaint many times. I’ve even voiced it myself. Many times I have no idea where the program is heading. I have no idea why a concept was introduced in a lesson or what is going on in the lesson. The topics don’t always seem to have a logical flow. But having gone up through Level C now, I have a much better picture of the end result. What seems crazy and disjointed at times is leading the student on the path to discovering concepts for themselves. Usually 10 lessons later I am thinking, “Brilliant! This is brilliant!” That’s when I realize I’ve just taught my child multiplication and she truly gets it yet has no idea that she is actually multiplying. It was simple, seamless, and so so sneaky. I just follow the instructions in the teacher’s manual and my children are slowly progressing through math concepts and completely understanding them. They don’t just know a formula, they understand why they are doing certain things. The program introduces things in a roundabout way that brings the child to the discovery of the concept. I have found many of the topics to be effortless to teach. We don’t have tears or frustration, we have light bulb moments. We play games together. My kids breeze through worksheets and enjoy math time. It works so well for different learners. Curly is more of a paper and pencil gal so we sometimes skip over the games and I let her practice with the speed drill worksheets. Tiger lives for the games so we spend more time on those. Bee needs the visuals of the manipulatives so I make sure we use as many as possible in every lesson for her. She wants to touch and see her math. Math is approachable, flexible, and fun! I never thought I’d say it. But it’s so very very true. I now have confidence in my own math abilities and I’ve seen my children blossom into little math lovers who can manipulate problems and find 4 different ways to solve any given problem. I love the problem-solving skills that it promotes! I love the way my kids can conceptualize the math problems. I’m so thankful for Right Start Math. I plan to use it forever! I’m only sad they don’t have a high school program. It has been one of my most treasured homeschool curricula finds. I am a "mathy" mom and absolutely love RightStart math. I found the curriculum on the last day that I was attending a homeschool convention. I knew what I was looking for in a math program and had given up. The RightStart booth was on the very last aisle. I've started each of my children from the beginning using the curriculum to give them a good foundation. I agree about the teacher intensive and price aspects that may deter many parents, but the results are so worth every dime I've spent and time I've sat by the sides of my children working through the material. They don't just do math, but they understand math and that is what I want them to do. I totally agree! I'm so thankful that someone mentioned Right Start to me several years ago. It has given my children such a great foundation. It is worth all the time and effort I have to put in! We are excited to start Level D in May! We love Right Start. My son is in C and my daughter is in B (oldest using another program because we didn't know about RS then). My son is flying through his book, while my daughter is having a hard time with B. I appreciate your sharing about similar struggles…we have tried extra games, tablet math games, Bedtime Math, and Life of Fred to take the pressure off and still "do math." She STILL does not understand the groupings by five on the abacus, so she counts. I finally let it go and am just continuing on, figuring it will click at some point. We took a break and used the above resources and just got back into B, and she is having fun again. Thank you for sharing! Thanks for this post! I have been looking at getting Right Start Math for almost a year now…I know it's the program I want to start with, I just can't decide when to start it. The information you gave here was very helpful! My oldest is 5 1/2 and we have yet to start teaching him math "formally." I like the fact that you mention there is very little writing. I feel he is ready for Math but he gets frustrated easily with trying to write…so it seems all the games and manipulatives would be great for him. How old was Curly when you started Level A? Do you think one could start with Level B without missing anything? I noticed you started with Tiger in preschool. Do you think level A would be too easy for a 5 1/2 year old? There is very little writing in Level A and not too much in B. I love that about the program! Math doesn't need to have tons of writing and much of it should be done mentally and orally and especially kinesthetically. Curly was in the middle of first grade when I put her in A. She was struggling terribly and needed to start over with math. Starting with A was a great confidence boost for her. 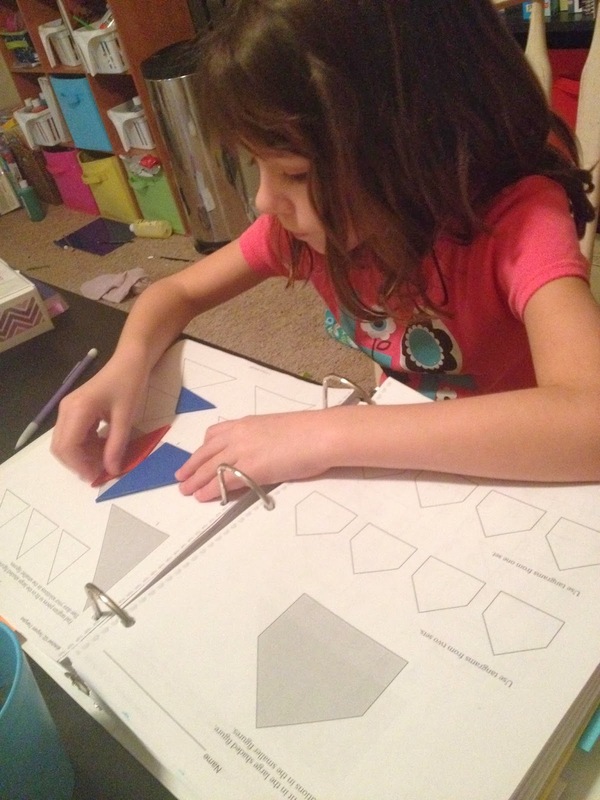 She needed the slow start to bolster her confidence to keep trying with math. Tiger was 4 1/2 when he began A. So there is a huge difference in their ages when we began that level. Yes, you could start with B and not miss too much. It includes great review at the beginning and has abacus work so that you understand how to use the abacus in the lessons. Right Start recommends to start with Level B if the child has gone through a kindergarten math program and is able to do addition up to 10. If not, then they recommend Level A.
I think you should call them and discuss placement. They are very helpful. If A is a better fit you can work through it more quickly if your son is ready. If you decide to go with B, you can start slowly and work at his pace. I have found the program to be very flexible and easy to adjust. Curly had to move very slowly through the levels and Tiger is blasting straight through.